Justin Bieber has been known to hit the streets, wherever he travels, and go skateboarding as a way to clear his mind and enjoy a little alone time. And on Monday, that's exactly what he did while vacationing in the South Bay section of Los Angeles. By the end of his brisk ride along the sidewalk, he hooked up with wife Hailey Baldwin, and the two drove off in their brand new Lamborghini Urus. 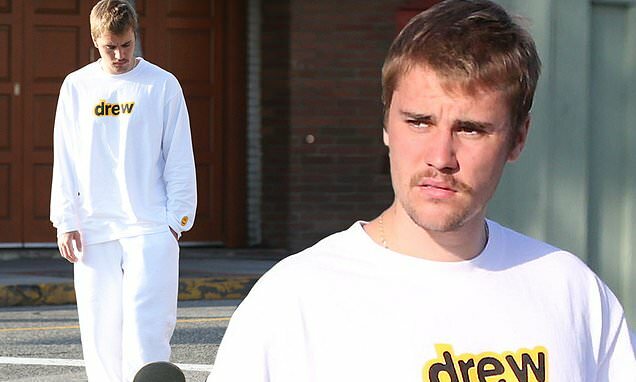 It didn't take long for the pop superstar to garner the attention of passer-byes, dressed in an all-white ensemble from his Drew clothing line that consisted of sweatpants and a long-sleeve sweatshirt with the logo on the front. The Love Yourself singer appeared to be unfazed by anyone or anything as he cruised along, occasionally checking his cell phone. But then, as he maneuvered around people and traffic, fans began to shout out his name when they realized it was him. Seemingly enjoying the sun and fresh air, Bieber continued to ride up and down the sidewalk and the street. Then, just as the fan shot-outs began to grow louder, Bieber picked up his skateboard, cautiously walked across the street to his awaiting wife, Hailey, who was parked in their new luxury Lamborghini.